There are many ways to cut stainless steel. Laser cutting and plasma cutting are fairly standard practices in modern steel production. They both have a place due to different advantages. 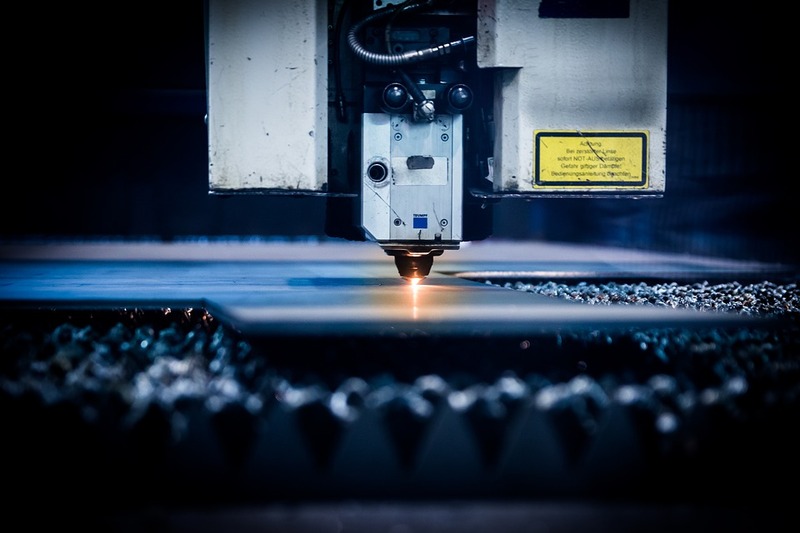 Our laser cutting technology uses very high-energy, accurately focused laser beams to cut at incredible precision with minimal waste in material. Because there are limits to the thermal nature of laser technology to certain thicknesses of stainless steel, we do not use laser cutting for sheets that are thicker than approximately 25 to 35 millimeters. While laser cutting is initially more expensive, the minimal material waste makes it ultimately cost effective and more efficient than other technologies. The end result is clean, precise lines with nearly invisible bead welds. Plasma cutting uses an inert gas, such as argon, hydrogen, or shop air. The gas passes through a fine nozzle at extremely high pressure, together with an electrical arc. This is resulting in a plasma jet that cuts the steel. High temperatures result on contact with certain conductive metals. The process rapidly cuts and simultaneously displaces vaporized material. Plasma cutting is ideal for larger thicknesses of stainless steel. However, the precision of the cut is less than that of laser cuts. This is fine for a finished product that requires less accuracy at a lower initial cost. It is suitable for conventional welding applications. There are at least four different types of stainless steel. Some lend themselves really well to laser cutting technology, while others fit better for plasma cutting. Austenitic stainless steel is one of the most commonly used steels in the construction industry. Combined with nitrogen, nickel, and manganese, the structure of austenitic stainless steel is similar to common steel. Yet, it is easier to form and weld. Hardening austenitic stainless happens without the use of heat, yet it is a very high strength material. Hence, austenitic stainless steel is ideal for our laser cutting technology. Ferritic stainless steel is an alloy that includes chromium and carbon. This steel lends itself extremely well to thinner sections with smaller or no welds. This makes it suitable for laser cutting. Ferritic stainless steel is very resistant to stress corrosion cracking. Martensitic stainless steel is most similar to ferritic stainless steel with chromium and carbon making up this alloy. One can temper and harden martensitic stainless steel. It is considered a magnetic type of steel with less formability. It is often used in applications requiring sheet and plate metals. Duplex stainless steel is a combination of ferritic and austenitic metals. It is higher in strength than either of these by themselves. Duplex is also resistant to stress corrosion cracking. It is also magnetic and lends itself well to welding. This is a steel that behaves well when cut using laser technology. With our laser cut steel products we are able to provide precise profiles for a variety of industries where precision cuts and micro-bead welding are preferable. Here are a few of those applications. Back in the 1970s and 1980s, carbon steel was the typical material for constructing nuclear power plants. Today, many of these plants need reparations with less corrosive materials. Therefore, many carbon structures are being repaired or replaced with 316/L laser fused stainless steel. One of our largest projects was repairing a South Florida nuclear power plant that was susceptible to corrosion from the humid saltwater climate. Stainless steel is a perfect match for the marine industry where corrosion resistance is imperative, especially in the manufacturing of lift and boarding equipment for large and small sea crafts. The construction of nautical cranes for example need materials that can withstand the detrimental exposure to saltwater, humidity, and temperature differentials. Duplex stainless steel offers a higher yield strength and better corrosion resistance than other stainless steels. So our custom laser fused profiles made of duplex stainless steel fit the bill for the marine industry. It is no secret that architects and engineers are enamored with the beauty and efficiency of using Architecturally Exposed Structural Steel (AESS). Stainless steel is the product of choice due to its corrosion resistance, refined surface finishes, workability, strength, hygienic qualities, and low maintenance. Laser fused shapes and profiles are of particular interest to designers because of the clean lines and nearly invisible welds. Designers, including artists, really appreciate the aesthetics and durability of the material. All of these can be viewed in detail on our online product catalog. Stainless Structurals offers a variety of products produced using different methods and technologies. Our laser production process results in highly refined stainless steel components that are appropriate for use in a variety of industries. The process is our most popular due to its efficiency and the limitless capabilities. The profiles can have varying degrees of thicknesses and are available in different grades of materials fused into one section. Another advantage is that laser cut and fused profiles tend to have better surface finishes. Our laser fused sections go through a stringent quality control process to ensure the precision and clean lines of the finished products. Please contact us to find out more about our worldwide services, including our laser cutting technology and the profiles that are available.